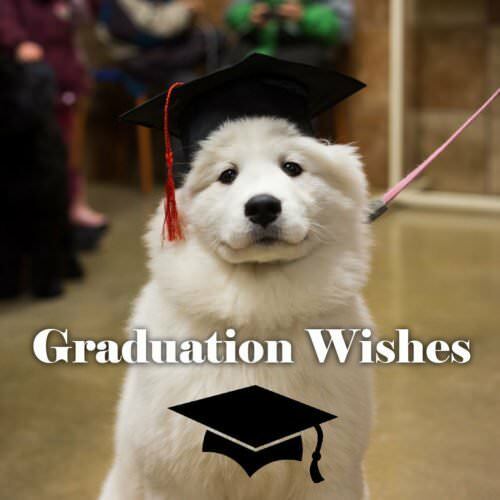 Graduations offer us an opportunity to pat our friends and loved ones on the back for persevering to complete studies or training of some kind. Your girlfriend will appreciate a message of encouragement and love on her graduation day. 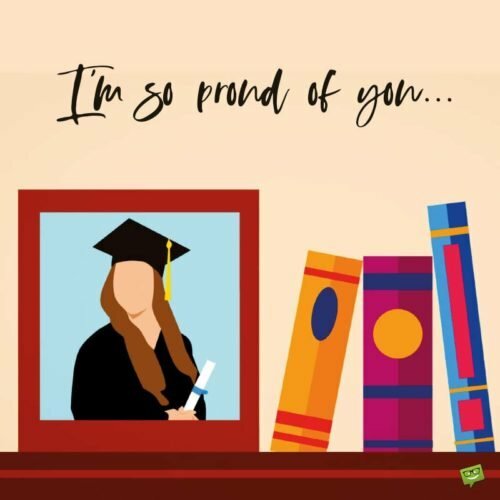 Here are some beautiful and reassuring wishes to send to her as you both celebrate the remarkable occasion of her graduation from school. My head just got swollen, and I can’t stop talking about you to my friends. Congratulations, my one and only love for being the overall best graduate. May God’s blessings continue to be showered upon you. Congratulations! I saw your success from afar. You are an inspiration to me, and I know I can do it too because you are by my side. May all your dreams come true in incredibly spectacular ways. I have no doubt our future is going to be great. You have proven to me you are for real. Now what next? Maybe our wedding plans. Congratulations, my sweet love! May beautiful achievements like this graduation continue to accompany your life. Congratulations, sweetheart! Thank you for making both of us proud. I made the right pick. May you never stop shinning. Your graduation today makes me believe that dreams are to be worked at. You never stop pushing, and I now see the result. Keep making me proud everywhere you go. Congratulations. So you are really smart! I thought you only blabbed to get my attention. Congratulations! You are my woman and my forever love. I’m so proud to be with you. Not only are you an extremely beautiful woman but you are also remarkably intelligent. I am truly blessed by the heavens to have you in my life. Congratulations. I love you. Stay blessed. Congratulations, my one and only sweet love. 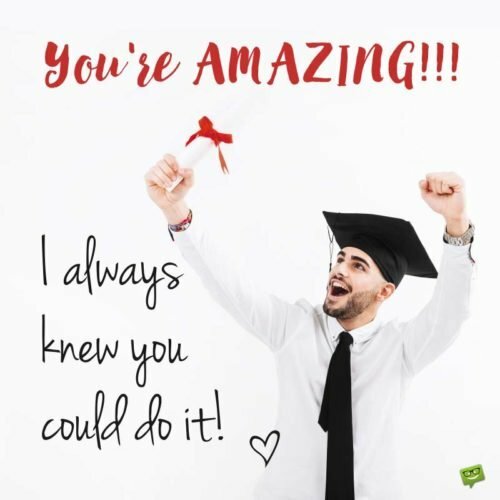 You did it in an absolutely outstanding way! May you never stop accomplishing remarkable things. Sweetheart, I am encouraged by your success today to give life my best shot. From today, you are my mentor. Warmest congratulations to you for teaching me it is possible. May your life never stop glittering. It is all over now! And you have won for yourself a bright future. Congratulations to you, my love. I can’t wait to see you shine brighter than the sun. I am highly elated on this beautiful day because the love of my life has achieved a great feat. No one else could be happier than me. Keep on shinning, baby. Congratulations! Congratulations, dear darling! Keep flying all the way to the top. I am your number one fan…today and forever. I know from the bottom of my heart that your prosperity in life will know no bounds. I love you. I have never doubted your great potentials, and today it is confirmed. Congrats! Baby, you are the best graduating student, and I couldn’t be prouder. I can’t stop boasting about you. Congratulations! As you go out there, be who you truly are, a hardworking and determined young woman. But hey, tell all the guys you meet that I say you are taken. Congratulations! I love you. What a joy it is to see you graduating in such an outstanding way! Congratulations my best friend and the love of my love. Congratulations, dearest girlfriend. I am going to celebrate you for a longtime because greatness awaits you out there. Your graduation day is definitely one of the happiest days of my life. I’m more than proud to have such a phenomenal girl like you in my life. May the smile that beautifies your face today never fade. Congrats, baby. Congratulations for not allowing anything to water down your dreams. I love you, my sweetie pie. Never stop having faith in your dreams, for I believe you have the power to achieve all of them. Baby, I send you heartfelt congratulatory wishes on your graduation today. May God be with you as you go out fully to contribute your worth to the world. Well done. Your dreams of becoming a graduate have now become a wonderful reality. I can’t put into words how highly elated and proud I am to be your boyfriend. Big congrats to you, darling! Congratulations on graduating, my dear! I know you will make it very big in this lifetime. May God always walk with you and bless you. 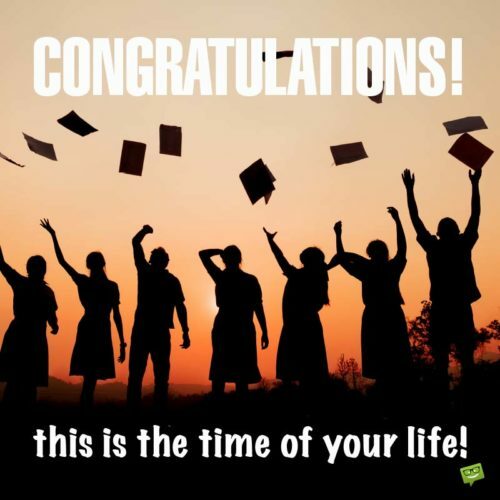 Your graduation today is the beginning of another wonderful phase of your life. I can’t wait to share that awesome life with you. Congratulations, my love. Sending very hearty congratulations to the apple of my eye. Sweetheart, just like my love for you has no limits, may your successes in life after this amazing graduation also have no limits. So proud and glad to call myself your boyfriend. What a great warrior queen you are! You made it in such a grand style! No words in the dictionary are profound enough to tell you how utterly proud I am of you. Congratulations, sweetheart! You gave this day a hot chase, and girl, you run and won well. Congratulations! May all you do after today be blessed by God. Congratulations to you again, my love. Special congratulations to you for being the best. Keep being the hero that you are, and know that when you succeed in anything, you fill my heart with incredible joy. Babe, I am humbled by your success. The future looks promising for us as I am learning from you and getting closer to my own dreams each day. Congratulations, my love. The qualities of an achiever are written all over you. With my prying eyes, I made the perfect choice. Congratulations on your graduation, sweetheart. You are being crowned today for winning a race that seemed impossible to many. I have always believed in your determination. Never stop winning for us, baby. Congratulations, and l love you. 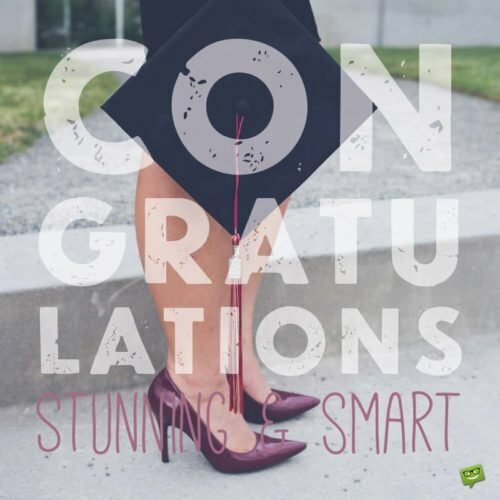 Your graduation is surely an outstanding achievement, sweetheart. Congratulations, and may your hard work continue to produce unequalled rewards. I could go on and on and list all the hurdles you went through to clinch this amazing victory. Words will never be able to express how elated I am about your success. Congratulations. Special hearty congratulations to you for being the best. Keep being the hero that you are, and know that when you succeed in anything, you make me smile. I pray you keep succeeding all the days of your life. Congratulations for crossing another great mile! The amazing thing is you never stop winning. Congratulations, my wonderful first class graduate girlfriend!